Many of my family and friends ask my advice on how to buy knives for their kitchen. The 3 most basic knives are the Chef’s or Santoku, Paring, and Bread knives. There are 6 important things to look for when buying knives. Style and Length: Chef’s –If you are looking for an all purpose knife, I would recommend getting a Chef’s knife because it will take care of all chopping, mincing and dicing tasks. Most people prefer an 8″ knife, but if you are tall, you may like a 10″ knife because it will give you more mobility. If the knife is shorter than 8″, you can’t achieve a good slicing motion. Santoku – A Santoku is another good option and is perfectly shaped for mincing. A 7″ Santoku is equivalent to an 8″ Chef’s knife. Paring – I like to be able reach my thumb to the tip of the paring knife so I can easily do tasks like hulling a strawberry. 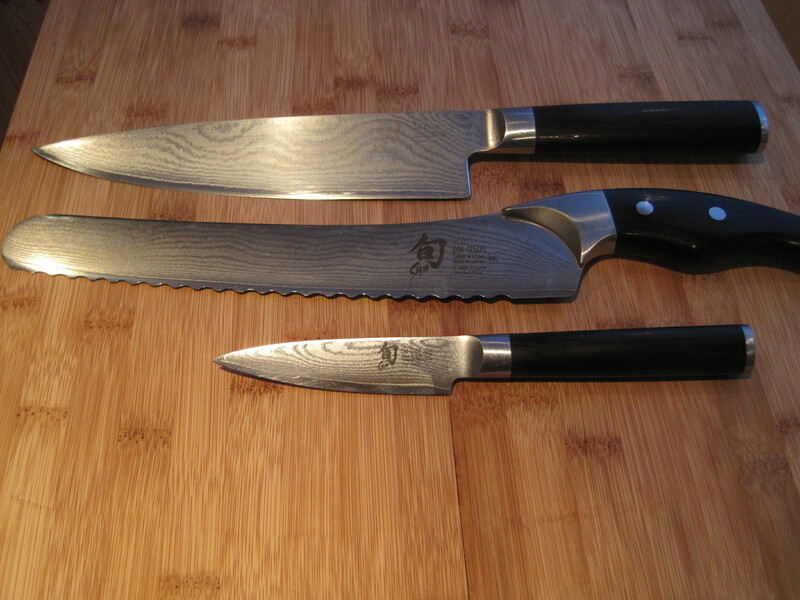 My favorite paring knife is 3″, but if you have long fingers you may prefer 3 1/2″ or 4″. Bread – The best bread knives are off-set meaning the handle is set about an inch higher than the blade. This enables you to slice through crusty French bread without slamming your fingers into the cutting board. Forged vs. Stamped: The best knives have a forged blade. You can tell a knife is forged when it has a thick bit of metal close to the handle called the bolster. The blade will be a little thicker, and much, much stronger than a stamped blade. A stamped knife (the metal blade is cut out of a big sheet of metal like a cookie cutter) will be thinner, have no bolster and will not last as long. Tang: You should check to make sure the blade of the knife is full-tang which means the blade goes all the way down the length of the handle and is usually held in with rivets. At the bare minimum the handle should go 3/4 of the way down the handle. If not, the blade will start to wiggle free of the handle within a couple of years of use. Metal: I prefer at least a high-carbon stainless steel blade and I especially love my Damascus steel Shun knives, pictured. For more information, Wasabimon wrote a great article on the metallurgy of knives. Brand: German style knives are the most common. Wusthof, Henckle, Chicago Cutlery, Calphalon etc. all make reasonably priced, well made knives. A Japanese style knife like Shun or Global will have a slightly thinner blade and lighter weight. Japanese knives will usually feel sharper when new, and stay sharp for longer. For the best quality, make sure the knife was actually manufactured in each brand’s country of origin. Comfort: Most importantly, the handle and weight of the knife should be comfortable to you. Most stores will let you try out or at least hold a Chef’s knife from each of the brands they carry. If you have more questions, let me know, I would be happy to answer them!